I think it's very easy to take for granted the amount of sensory experiences celebrating various holidays bring for our students on the spectrum. Since Halloween is on Friday, let's think about this holiday specifically. For starters- the costumes! My goodness, we all know a child on the spectrum I'm sure, that has sensory issues that stem from their clothing. Whether they are too tight, too loose, too itchy, maybe the tag is irritating or the seams in their socks just do not feel right along their toes. 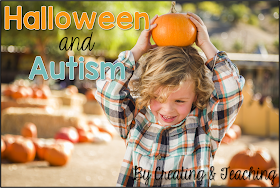 Imagine the sensory experiences that come along with a costume! The masks, the hoods, the tight clothing, most costumes are 1 piece suits- SO different than every day clothes. And what about the costumes with the fancy attachments? Or the dinosaur suits with spikes down the back. Those spikes might be so annoying! That added weight on the back, pulling down on the costume. One of these sensory experiences might send your student or child over the edge. Imagine the combination of multiple disturbances! Now, the decorations! This one I don't think of immediately as I do the costumes. It's easy for small children to be frightened by Halloween decorations, but a child on the spectrum may be startled by the simplest form of a decoration. I've met children who are petrified of a Jack-o-lantern. Added to that, the idea of pretend and make believe is so abstract to our learners on the spectrum so much of Halloween could be hard for them to understand. Such as ghosts and vampires, all these visuals and costumes that aren't real- just pretend. So what can we do to help? I want to provide more resources to the families of children in my classroom. This holiday season I have put together a helpful packet to send home with my students. 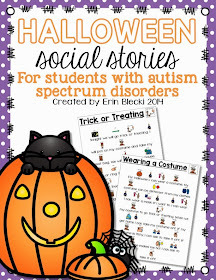 I have included 2 social stories, 2 articles, and trick or treat tags for our non-verbal students. None of this is original. In fact there are numerous options for social stories and trick or treat tags available for free online. However, what I came across social story wise did not fit my needs so I created my own. And I want to offer those to you for free to use with your families too! You can get the free download here. Is there anything special you do to help families with holidays?